St.Clairsville Sunrise Rotary members congratulate Sunrise Rotary Parent Scholarship recipient. 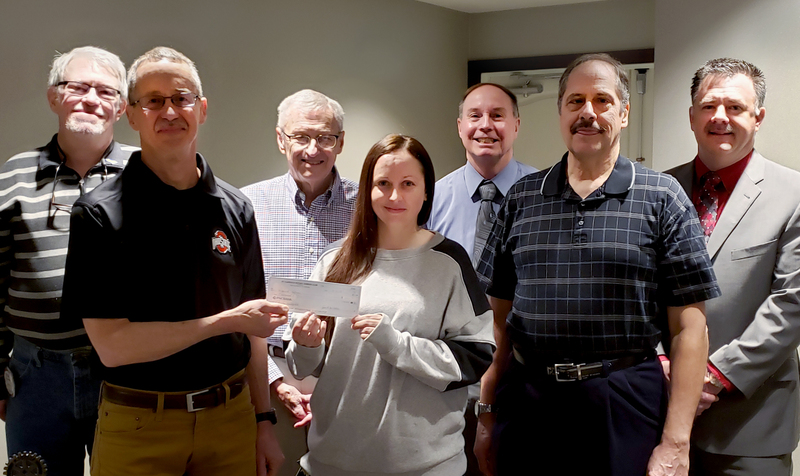 From left to right: Bruce Wille, Secretary; Jeff Vaugh, Committee Chairman; Jack McClain, Treasurer; Mariah, Belmont College Student and Scholarship Recipient; Chuck Dawson, Belmont College Professor of Engineering and Rotary Member; Dave Barlow, President; A.C. Wythe, Scholarship Committee Member. students has been awarded the St. Clairsville Sunrise Rotary Parent Scholarship. Mariah, a double major in Associate of Science and Pre-Nursing at Belmont College, was recognized at the Sunrise Rotary breakfast meeting on Thursday, April 11th. To be eligible for the $1,000 scholarship, a student must: be enrolled at either Belmont College or Ohio University Eastern; be a parent; have at least a 3.0 GPA; complete 15 credit hours of school work; and submit a 250-word essay describing themselves and their career goals.